Croyde travel poster and seaside print by Becky Bettesworth... Croyde is part of Becky Bettesworth's vintage style collection of seaside prints and posters from a bygone era. Award winning Devon artist, Becky, has drawn inspiration for her fresh style with a nostalgic twist from the classic railway travel posters. 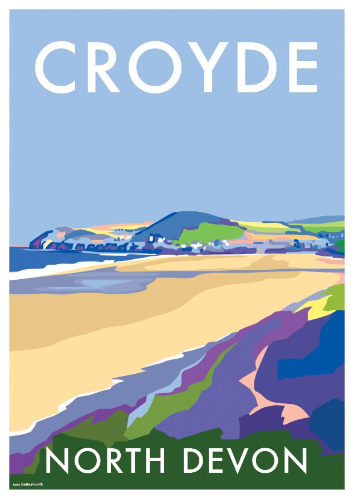 She has captured The village of Croyde on the North Devon coast with its old world charm and golden sandy beaches, making this print the perfect holiday momento.